saghafi, K., Ahmadi, J., Asgharzadeh, A., Bakhtiari, S. (2013). The effect of microbial inoculants on physiological responses of two wheat cultivars under salt stress. International Journal of Advanced Biological and Biomedical Research, 1(4), 421-431. Kobra saghafi; Jafar Ahmadi; Ahmad Asgharzadeh; Shiva Bakhtiari. "The effect of microbial inoculants on physiological responses of two wheat cultivars under salt stress". 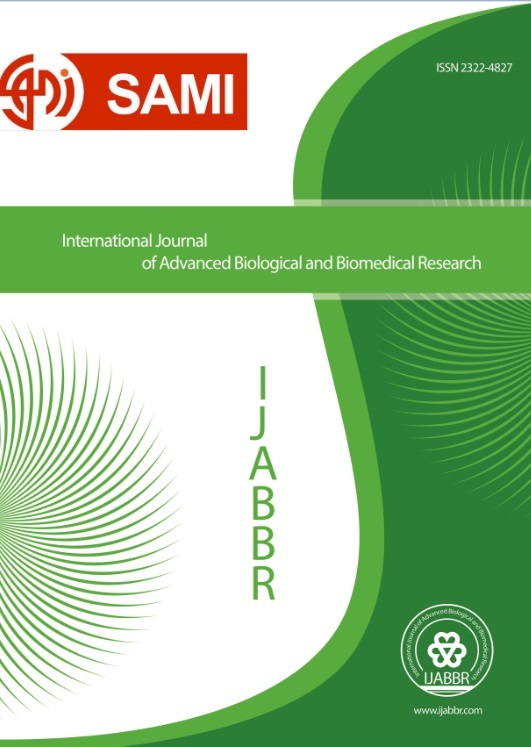 International Journal of Advanced Biological and Biomedical Research, 1, 4, 2013, 421-431.
saghafi, K., Ahmadi, J., Asgharzadeh, A., Bakhtiari, S. (2013). 'The effect of microbial inoculants on physiological responses of two wheat cultivars under salt stress', International Journal of Advanced Biological and Biomedical Research, 1(4), pp. 421-431.
saghafi, K., Ahmadi, J., Asgharzadeh, A., Bakhtiari, S. The effect of microbial inoculants on physiological responses of two wheat cultivars under salt stress. International Journal of Advanced Biological and Biomedical Research, 2013; 1(4): 421-431. Salinity is one of the most important abiotic stresses that limit crop growth and productivity. This study focuses on the effects of different strains of plant growth promoting rhizobacteria (PGPR) on the physiological responses of two wheat cultivars under normal and salt stress conditions. The wheat cultivars selected include one which is tolerant to salinity (Kavir) and one which is sensitive to salt-stress (Qods). The factors considered were four levels of PGPR (B1 to B4) and two levels of salinized culture solution (S1 to S2). Before planting, the wheat was inoculated with strains of PGPR. Results showed that salt stress reduced RWC, Leaf Chlorophyll index and photosynthesis characteristics. The application of PGPRs strains reduced the negative effects of saline stress by increasing the leaf’s relative water content and enhancing photosynthetic pigment production in both stress and normal condition. The mechanism of PGPR elicitation of growth promotion may involve the enhancement of root hair development and therefore increased relative water content, chlorophyll pigments and water uptake. Single and dual inoculations of PGPR strains showed variations in their effect to enhance the wheat tolerance to salt. The bacterial consortium was effective for wheat plants as an acceptable and ecofriendly technology to improve plant performance and development. Antolin. MC., Yoller. J., Sanchez-Diaz. M., (1995). Effects of temporary drought on nitrate-fed and nitrogen –fixing alfalfa plants. Plant Sci, 107: 159-165. Cheeseman. J.M., (1988). Mechanisms of salinity tolerance in plants. Plant Physiol, 87: 547-550. Cornic. G., (2000). Drought stress inhibits photosynthesis by decreasing stomatal aperture- not by affecting ATP synthesis. Trends plant science, 5: 187-198. Dimkpa. C., Weinand. T., Ash. F., (2009). Plant-rhizobacteria interactions alleviate abiotic stress conditions. Plant, Cell and Environment, 32: 1682-1694. Glick. B.R., (2005). Modulation of plant ethylene levels by the bacterial enzyme ACC deaminase. FEMS Microbiology Letters, 251: 1-7. Grichko. E.J., Glick. B.R., (2001). Amelioration of flooding stress by ACC deaminasecontaining plant growth-promoting bacteria. Plant Physiology and Biochemistry, 39: 11-17. Han. H.S., Lee. K.D., (2005). Plant growth promoting rhizobacteria effect on antioxidant status, photosynthesis, mineral uptake and growth of lettuce under soil salinity. Research Journal of Agricultural and Biological Sciences, 1: 210-215. Hare. P.D., Cress. W.A., (1997). Metabolic implications of stress-induced proline accumulation in plants. Plant Growth Regulation, 21: 79-102. Hayat. R., Ali. S. Amara., U. Khalid., R. Ahmed, (2010). Soil beneficial bacteria and their role in plant growth promotion: a review. Annals of Microbiology, 60: 579-598. Lichtenthaler. H.K., (1987). Chlorophylls and carotenoids: Pigments of photosynthetic biomembranes. Methods Enzymol, 148:350-382. Lutgtenberg. B., Kamilova. F., (2009). Plant-growth-promoting rhizobacteria. Annual Review of Microbiology, 63: 541-556. Manivannan. P., Abdul Jaleel. C., Sankar. B., Kishorekumar. A., Somasundaram. R., Lakshmanan. GMA., Panneerselvam. R., (2007). Growth, biochemical modifications and proline metabolism in Helianthus annuus L. as induced by drought stress. Colloids and Surfaces B: Biointerfaces, 59: 141–149. Marcelis. L.F., Hooijdonk. H.V., (1999). Effect of salinity on growth, water use and nutrient use in radish (raphanus sativus L.). Plant and Soil, 215: 57-64. Mationn. MA., Brown. JH., Ferguon. H., (1989). Leaf water potential, relative water content and diffusive resistance as screening techniques for drought resistance in barley. Agron. J, 81:100-105. Merah. O., (2001). Potential importance of water status traits for durum wheat improvement under Mediterranean conditions. Journal of Agricultural Research,137:139-145.33(3):521-533. Nadeem. S.M., Zahir. Z.A., Naveed. M., Arshad. M., Shahzad. S.M., (2006). Variatin in growth and ion uptake of maize due to inculation with plant growth promoting rhizobacteria under salt stress. Soil Environ, 25: 78-84. Ommen. OE., Donnelly. A., Vanhoutvin. S., Van Oijen. M., Manderscheid. R., (1999). Chlorophyll content of spring wheat flag leaves grown under elevated CO2 concentrations and other environmental stresses within the ESPACE-wheat project. Eur. J. Agron, 10: 197-203. Parida. A.K., Das. A. B., (2005). Salt tolerance and salinity effects on plants: A review. Ecotoxicology and Environmental Safety, 60(3): 324-349. Ravindran. K.C., Venkatesan. K., Balakrishnan. V., Chellappan. K.P., Balasubramanian. T., (2007). Restoration of saline land by halophytes for Indian soils. Soil Biol. Biochem, 39: 2661-2664. Rodrguez. H., Fraga. R., (1999). Phosphate solubilizing bacteria and their role in plant growth promotion. Biotechnologies Advances, 17: 319-339. Rozena. J., Flowers. T., (2008). Crops for a salinized world. Science, 322, 1478. Sabater, B., Rodriguez, M.I., 1978. Control of chlorophyll degradation in detached leaves of barley and oat through effect of kinetin on chlorophyllase levels. Physiol. Plant, 43: 274-276. Sairam. RK., Siravastava. GC., (2002). Changes in antioxidant activity in subcellular fractions of tolerant and susceptible wheat genotypes in response to long term salt stress. Plant Sci, 162:897-907. Santos. C., Pinto. G., Loureiro. J., Oliveira. H., Costa. A., (2002). Response of sunflower cells under Na2SO4. I. Osmotic adjustment and nutrient responses and proline metabolism in sunflower cells under Na2SO4 stress. J. Plant Nut. Soil Sci, 165:366-372. SAS. Institute., (2010). SAS/STAT Users Quide Standard Version 9.1.3 (SAS Institute Inc., Cary, NC, USA). Shaharoona. B., Arshad. M., Zahir. Z.A., (2006). Effect of plant growth promoting rhizobacteria containing ACC-deaminase on maize (Zea mays L.) growth under axenic conditions and on nodulation in mung bean (Vigna radiata L.). Letters in Applied Microbiology, 42: 155-159. Siddique. MRB., Hamid. A., Islam. MS., (2000). Drought stress effects on water relations of wheat. Bot. Bull. Acad. Sin, 41:35-39. Tiwari. J.K., Munshi. A.D., Kumar. R., Pandey. R.N., Arora. A., Bhat. J.S., Sureja. A.K., (2010). Effect of salt stress on cucumber: Na+-K+ ratio, osmolyte concentration, phenols and chlorophyll content. Acta Physiol. Plant, 32: 103-114. Turner. N.C., (1981). Techniques and experimental approaches for the measurement of plant water status. Plant Soil, 58: 339–366. Verbruggen. N., Hermans. C., (2008). Proline accumulation in plants: a review. Amino Acids, 35: 753-759. Prado. FE., Boero. C., Gallardo. M., (2000). Effect of NaCl on germination, growth, and soluble sugar content in Chenopodium quinoa willd seeds, Bot Bull Acad Sinica, 41: 27-34. Meloni. DA., Oliva. MA., Ruiz. HA., (2001). Contribution of proline and inorganic solutes to osmotic adjustment in cotton under salt stress, J Plant Nutr, 24: 599-612.